Reinhard Bonnke Crusade in Nigeria, Africa where more than a million people attended each night. Jesus preached in Mathew 24 that the end times would be one of widespread deception, cold-selfishness, wars, famines, earthquakes and disasters. We certainly can see these things happening by listening to the news and making our own personal observations. Jesus said these things indicate his return is near. He said they were like birth pains or labor pains that occur before a baby is born. These are signs of the times and when we see these things happening we should know his return is near. Jesus also said in Matthew 24 that Christians in the end times would be put to death and hated by all nations. You see persecution increasing even in the United States. Recent U.S. military training manuals listed Evangelical Christians, Catholics and some Jews along with the Klu Klux Klan, Al-Qaeda and Hamas as potential terrorists (reference). Reading Bible verses against homosexuality in public is now considered by many as “hate speech.” Preachers are being arrested for preaching against immorality and quoting from the Bible (reference). In Europe and North America there is political pressure to label preaching from the Bible as hate speech. I believe this labeling will give those who hate Christians an excuse for further persecution. Governments will regulate and ban religious hate speech even more, and then the courts will rule in their favor. If Christians stand idly by it will only get worse in the near future. I believe we still have time to turn things around, but it will require courage to stand against the rising tide of antichristian hatred. The United States can participate in the greatest revival in the history of the world that is going on now; however, in the last of the last days it will be too late. In the last of the last days the antichristian forces will behead Christian believers for their faith in Jesus Christ. This is already happening in some Arab speaking countries. Are we living in the last days before the last of the last days? During this time of increased persecution in the last days, the Gospel of Jesus Christ would continue to be preached—and then the end would come. A recent theological study published in June shows that Christianity is spreading around the world. 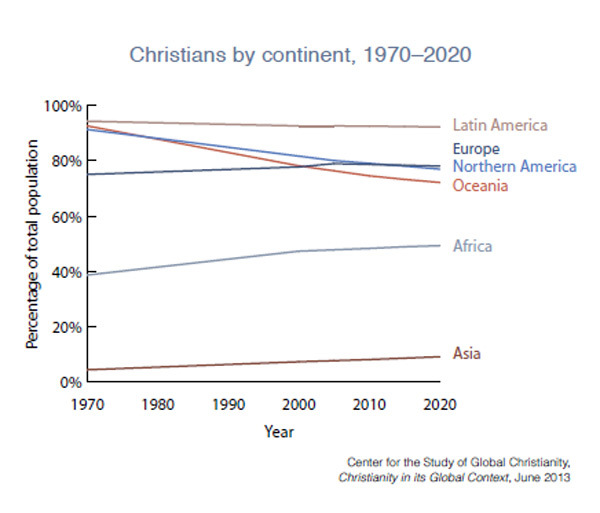 Unfortunately, it shows a decline in North America and Europe, but it also shows a dramatic increase in in the overall percentage of Christians in other parts of the world like Africa and Asia. The study is based on statistics from the last 40 years beginning in 1970. It projects current trends through 2020. The first chart that follows is from the study and it shows the decline of Christianity in Europe, North American and Oceania. It shows strength in Latin America remaining strong and increasing in Africa and Asia. 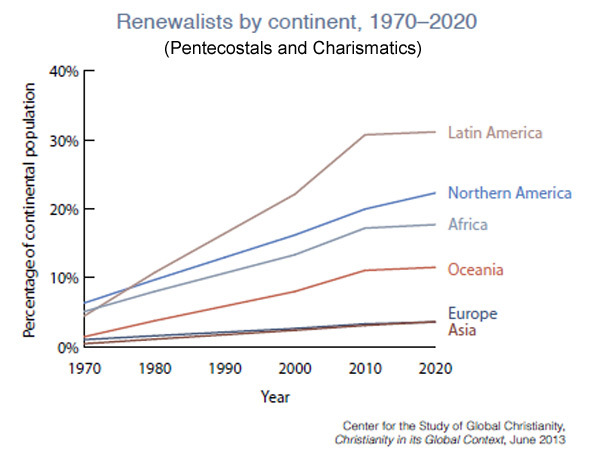 The second chart is from the same study and it shows the number of “spirit-filled” Pentecostal and Charismatics are increasing as a percentage of Christian in all areas of the world. The study shows their numbers have increased dramatically in all areas including North America and Europe during the last 40 years. It is interesting to note that the type of Christianity that has grown the fastest is what the theologians call Renewalists. This group is made up of Pentecostals and Charismatics. This group includes all “spirit-filled” Christians that believe in the power of the Holy Spirit and in biblical signs and wonders. This should not be surprising. Jesus said his followers would receive power to be his witnesses when the Holy Spirit comes.. It appears by these latest figures that Christians that believe in, and operate in the power of the Holy Spirit are fulfilling the commandment to go preach the Gospel to all nations. They are operating in the same power that the early Church operated in when the Church began. They are witnessing by demonstrating the Gospel with signs and wonders like those early Christians which you read about in the Bible in the book of Acts. Their Pentecostal and Charismatic numbers have increase dramatically since 1970. The study also shows that there was an overall decline in atheists and agnostics around the world. Former Soviet Union atheists are turning to Jesus Christ in record numbers. Atheists and agnostics are seeing their numbers dwindle all around the world. The world is becoming more religious. The study shows that Christians and Muslims are increasing in numbers. It appears the stage is being set for the final showdown predicted during the end times that will take place in the Middle East that is centered around Israel and the city of Jerusalem. Is it time for Jesus to come back? This study of modern Christianity shows that the Gospel is being preached in all nations. This study shows Jesus’ words are being fulfilled. The end may be nearer than you think! Are you ready for Jesus to return? The clock is running out of time for this age. Every day we are closer to the return of Jesus. Are you doing your part to proclaim the Good News to those around you that are dying or perishing in their sins? The following link will download 92 page study talked about in this story for free to your browser. Once you download to you browser, you can save it to your computer or store in in your phone: Click here to download the study mentioned in this story. Are you ready for the return of Jesus Chris? I wrote Faith for Difficult times to help prepare Christians to be ready for the return of Jesus. If you like what I have said in this story you might like to read my new book Faith for Difficult Times. It is now available as an eBook on Amazon.com. This book can be read on Kindles, PCs, Macs and smart phones with the free software from Amazon. Click here for more information about Faith for Difficult Times.